Nanette, I have so missed you! I think of you often, and send happy thoughts and prayers your way. Thanks for popping in, even if it's just for a minute. How are things anyway? Cute block! I've missed you too. Hope things are going ok there. Oh, Nanette, life does get in the way of our fun, doesn't it. That is a super cute block! Hope things get better for you all soon. Love you, my friend. The block is adorable. I have missed you. I hope you are taking care of yourself. You and your family come first. Prayers and hugs. Hurray! It seems the consensus from all the comments is that we've missed you. When I saw your post pop up, I jumped for joy, well as much as I can jump these days. 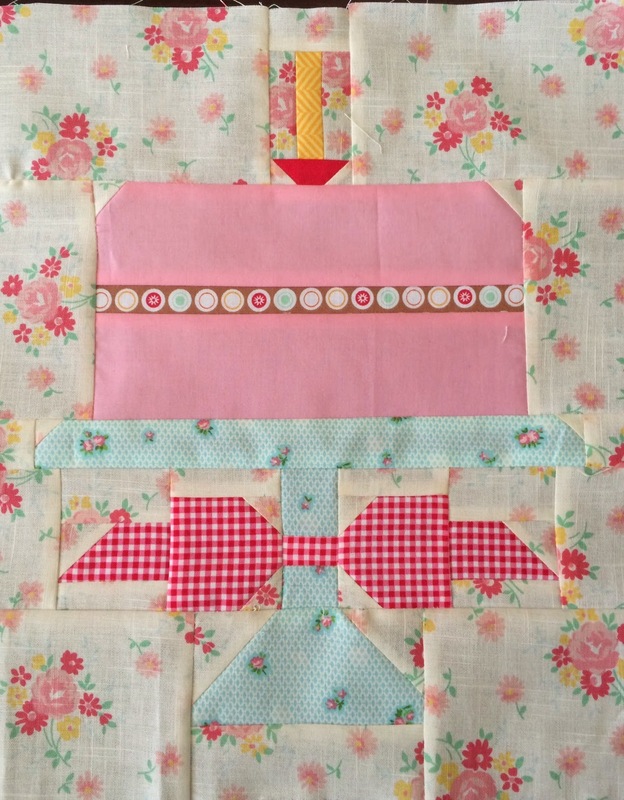 Even though you aren't blogging I am so happy to see you sewing, and your block is beyond cute. Let me know if it helps, lately I can't seem to sit down and do any sewing. 15 month old baby + my age = exhaustion. I love that cake block! So cute! I was just thinking of you the other day. Life does have a way of being complicated sometimes. I hope all is well with you! It is very nice to see you on here today! I LOVE your block! It is so adorable! I watch for your posts every day. It's been awhile. I hope you will share pictures while you take your much needed break. Sorry life is tough right now. Praying it's better soon. Your block is so cute, Nanette! That's a gorgeous block! I'm so tempted to try it. Love your block, and that fun background print! Such a pretty block Nanette! Miss reading your blog. Praying all is well! Elongate as long as you need to darlin,glad your well! Wonderful to see your blog post, Nanette! Hope you are well. 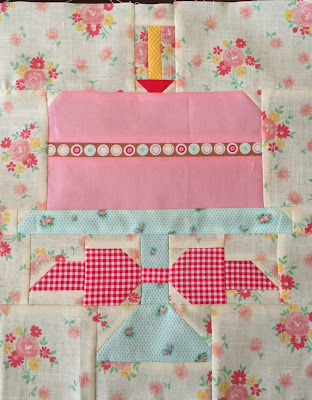 Delicious cake block, how fun to tie a bow around that cake stand and glowing candle... love the details! Good to see you post, sorry life is crowding out blogging. Stay well! Your cake plate is darling. Sweet block!! wishing you well! Lovely lady, lovely block. I miss you and your beautiful quilting. Hugs from California coming your way. That's my kind of cake - no calories! Loving Pink right now. So cute. Thinking of you! A lot.